Explore the causes of stress and the various ways you might manage its impact. 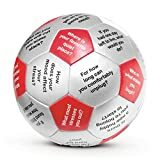 Toss the ball around and share your reaction to whatever prompt lies under your thumb. A soft 6 inch stuffed ball with loads of applications.